Noble Antony was a counsellor at the United VOICE Camp at Karimnagar in January 2015. He is a Masters student at the English and Foreign Languages University in Hyderabad. He writes about how VOICE Camp changed him and his worldview. The fascinating ‘Theory of Parallel Universes’ says that every moment of your life, every decision you take, splits your present self into an infinite number of future selves, all of which are unaware of each other. 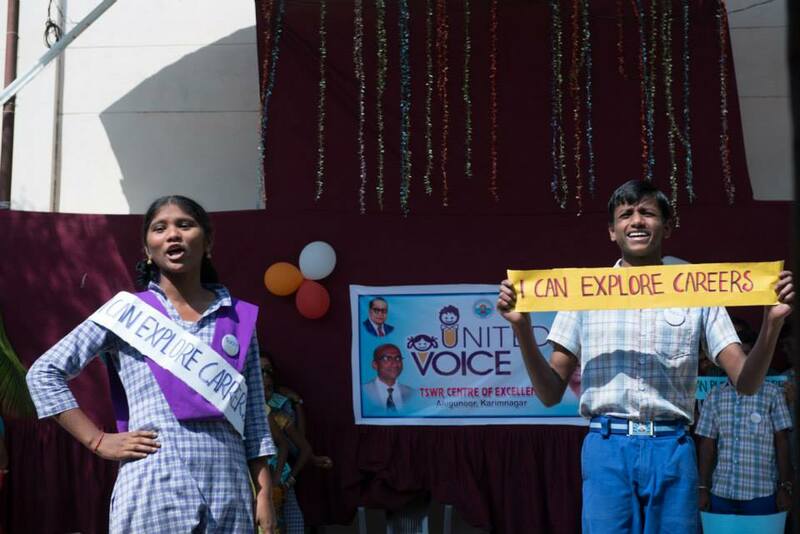 The moment when I decided to sign up for the United VOICE camp in Karimnagar, I landed myself in a parallel universe – where I was not worried about the number of classes I would miss, nor was I afraid of what the future holds! And I am happy to be here! It is funny to remember that ‘Multiple Universes’ was just one of the many things we talked about, during our many late night counsellor discussions at camp. I can never forget those or the silly jokes we cracked. I must mention though, that before camp started, I felt like the odd one out. At 23, I was the oldest of the selected camp counselllors, perhaps older than the camp co-ordinator herself. I was also the only one who didn’t know Telugu, the local language. But it worked well for me at Camp. I was the silliest of the lot, with my trademark grin, and I went around communicating with everyone in five different languages (including sign language). The Campers were the most beautiful part of camp and they have brought meaning to my life. Camp might have been just seven days but the transformation I saw in the campers was tremendous. I can never forget Anil, the boy who stuck to the corners of the room at the beginning of camp, head bent as if a yoke of invisible worries pulled him down. And on the final day, when asked of his ambition, he stood up to say that he wants become a neurologist to treat the suffering in his village. I stood there bewildered before I gave him a tight hug that he accepted with half opened arms. I met many such Campers, who used to refuse to go up on stage at the beginning of camp, but shouted their ambitions out loud on the final day. I am proud to say that I had a small role to play in these transformations. Camp not only changed the campers, but counsellors too. We learned and unlearned, agreed and disagreed, and laughed and argued. The campers taught us to dream bigger. Most importantly, we made a lot of good friends and met real heroes like IPS officer Praveen Kumar. Camp has transformed me. Watching the sun set over the Manair Dam in Karimnagar every evening, I realised that nothing can be more beautiful than nature. Sessions around the campfire made me realise how sharing of thoughts can bring people closer. I also learnt at Camp that there are things in life that are much more important than a good education, a successful career or money – like kindness or love. For, if it’s not love, then what brought tears to that kid’s eyes and what cause the lump in my throat when it was time to say good bye? If it’s not love, then what motivated a police officer to choose to run schools for the poor? What else could have made my eyes well up with tears as I listened to a poor child talk about his expedition to Mt. Everest? It was love. And it is moments such as these that have reaffirm my faith in humanity. Shinjini Chowdhury is a returning VOICE counsellor and worked with us as a trainer this winter. She spent a week in Khammam training counsellors and co-counsellors to impart the ‘Her VOICE’ curriculum. She writes about why she thinks VOICE camp is important. families? Their mothers have done the same, and so must they! It is a gender tussle at play, no doubt, along with the struggles of poverty.So education is a luxury, especially for girl children. They are absorbed into India’s vast sector of cheap, uneducated labour – their lot is only to support their families emotionally, economically. It is a vicious, self- feeding cycle. More than education policies, we are concerned about the approach to education. So, when we do get a chance to meet and spend time with these girls or their parents, we do not waste time on lessons – there is enough history and math taught in schools – we show them that they too have the spark. Learning can be enjoyable. More than that, learning can be a tool to help live with the awareness to exercise one’s rights. To you, who is reading this, we ask that you try to convince the next adolescent or parent you meet who does not believe in schooling, that it is a necessity. We ask you this because no number of laws will ever change a society unless we work on perspectives.